Glossybox has released their first spoiler for the August 2015 box! If you like GlamGlow, you're gonna be happy to see this. Every Glossybox will contain a GlamGlow YouthCleanse Daily Clearing Cleanser! It's a deluxe sample size that has a value of $14! YOUTHCLEANSE™ is a revolutionary Mud to Foam™ daily cleanser that combines the power of mud and the performance of foam for an innovative cleansing experience. It transforms into a gentle and effective foaming lather that dissolves makeup and impurities while removing dead surface cells. It is formulated with Brazilian superfruits acai, guarana, and acerola to provide potent antioxidants and flaxseed and quinoa, which are rich in omegas 3, 6, and 9 for stronger, healthier-looking skin. French sea clay revitalizes skin, microalgae scrub and phytic acid extreme gently exfoliate, and TEAOXI® green tea leaf delivers EGCG super antioxidants to protect against free radicals—working with ground ginkgo biloba leaf to optimize the skin’s natural renewal process. YOUTHCLEANSE™ helps to maintain the results of your current weekly GLAMGLOW® treatments. While I'm not a super huge fan of GlamGlow, this is a nice brand to add to their August box. And EVERYONE will have one of these. There will be four other products, too, though I don't know if there are variations for those. 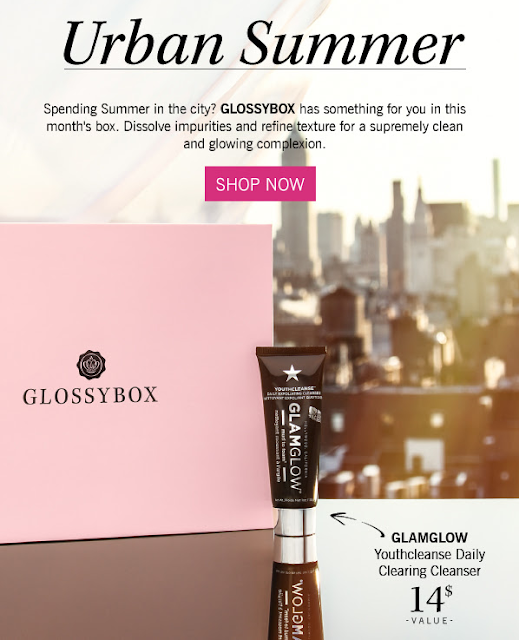 If you'd like to sign up for Glossybox, you can do that here. If you sign up, don't go without a coupon code! 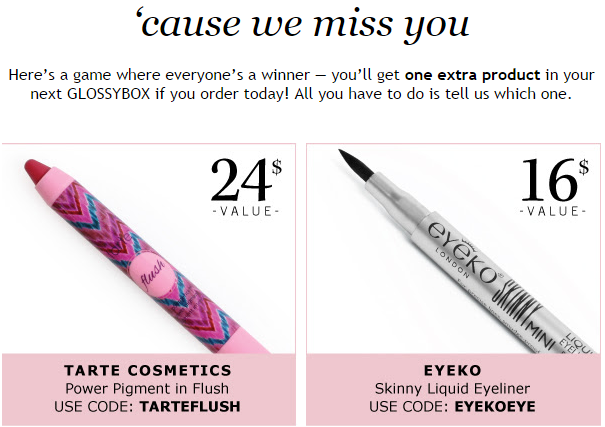 Get an extra item in your box with code EYEKOEYE or TARTEFLUSH! Coupon codes are good til August 7th or while supplies last.